In nature, the bees would never live close to each other. 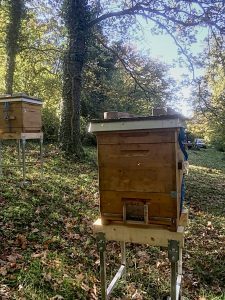 To live as close as is often the case in our apiaries promotes disease and mite transmission and there will be big difficulties to find out which one are the better for making splits or queen breeding. Since none of us where I live have big areas for ourselves available, we have to think what would be helpful to avoid the drawbacks this create. I think a setup with a few meters distance and the entrances in different directions helps a lot. The bees have killed a hornet that have dared to enter the hive. 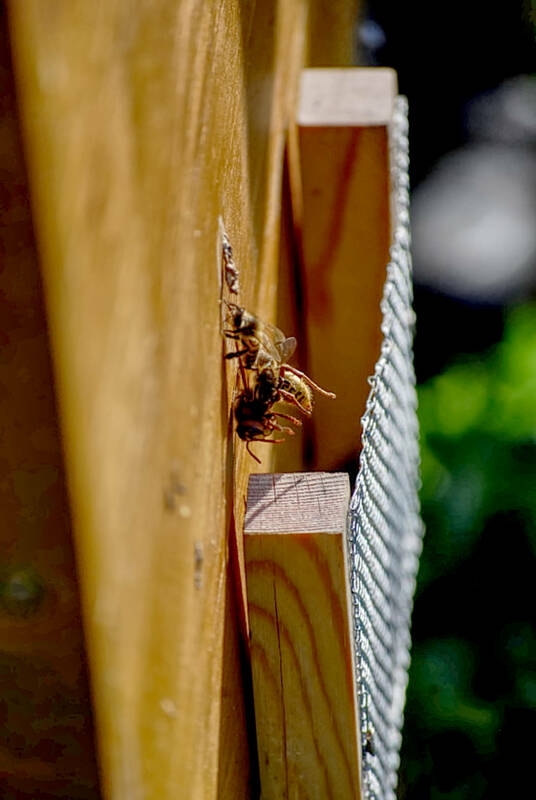 They have no problem getting rid and clean the hive of the dead hornet. In addition, you can use devices to hinder robbery, obvious strong robbery, and so called silent robbery that you have hard times to discover, but can cause a lot of so called reinvasion of mites. Small entrances and a robber screen all year round have had no disadvantages to the air conditioning and traffic of my colonies even with so called closed boards (not screened bottom boards). Also I have seen that the bees have had no problems to pull out the dead, as you can see in the hornet picture. 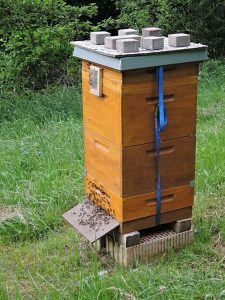 I have put a box with brood frames (without the queen) above the queen excluder to make a finisher for the grafted queen cells. An extra entrance above the queen excluder help drones to leave the box. It also hinders silent robbing. When making a queen cell finisher after grafting, you can use the robber screen on an extra entrance above the queen excluder for the drones which will follow the brood frames moved up there. So you can easily put on the box on the excluder for a finisher without shaking off the bees. The bees can protect the honey easier from robbers with the robber screen on. 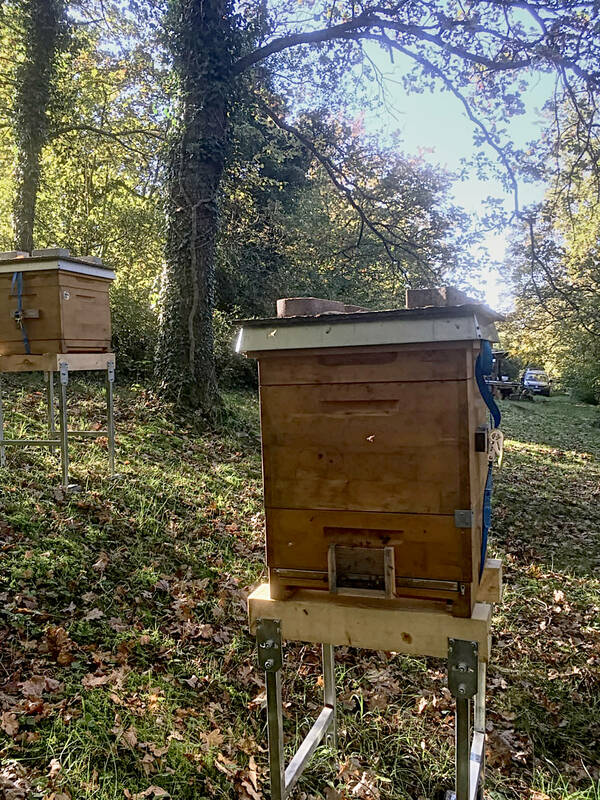 The robbery within an apiary is prevented with a robber screen on all the hives, even when making small nucs and splits and placing them in the apiary when there’s no flow. I calculate that drifting is prevented by about 40% with this robber screen in place. I estimated this when comparing the lighter colored elgon bees with my grey carniolans. Not much mixing at all between the colonies, not even the drones drifted. 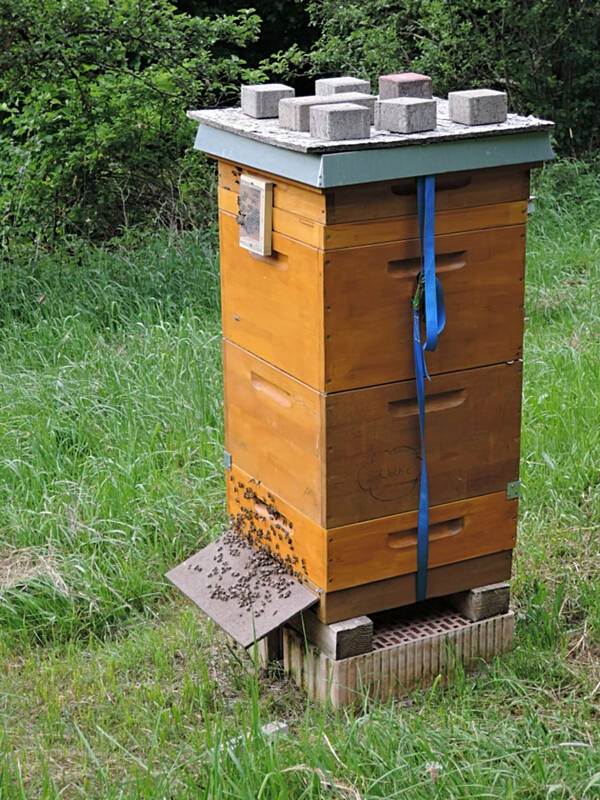 The robbery within the apiary is completely prevented, so it is also possible to place weak colonies, e.g. nucs and splits, very well protected. 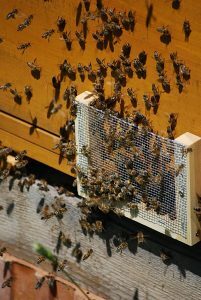 If all beekeepers would use robber screens, it would also hinder my bees to rob hives of other beekeepers and thus hinder the spread of mites through reinvasion. The only downside I have found is that bees could be easier taken by hornets and dragonflies. Sometimes they did not fly out, but stayed behind the screen when a hornet was hunting. But if the hornet went in, then the bees surrounded it and killed it. I think I will put the screens with the openings sideways this coming season, to make it easier for the bees to leave return. This entry was posted in Featured, Management, Varroa reinvasion and tagged apiary placing, varroa resistance by Erik. Bookmark the permalink.